Want to share your knowledge using an educational website? This list has some of the most awesome and best Education WordPress themes of 2018 that you can use right away to create your Education website. This list has the themes to let you create websites for schools, colleges, Kindergarten, daycare, Universities, or private tutors. It includes LMSs, courses and educational events website themes, online training or themes for creating a website for any kind of educational institute. This list also has themes especially aimed at kids pre-school, high-school or university. 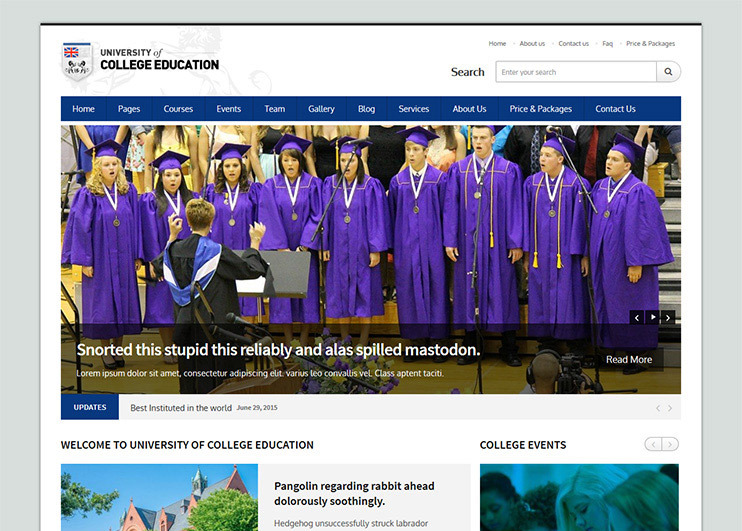 Here’s a simpler theme to create a website for your educational institute. The themes in this list are mega education systems with LMS. If you are looking for a simpler theme take a look at Education Academy WordPress theme by Templatic. It’s an easy to use the theme that you can use to create your own education based website within minutes. 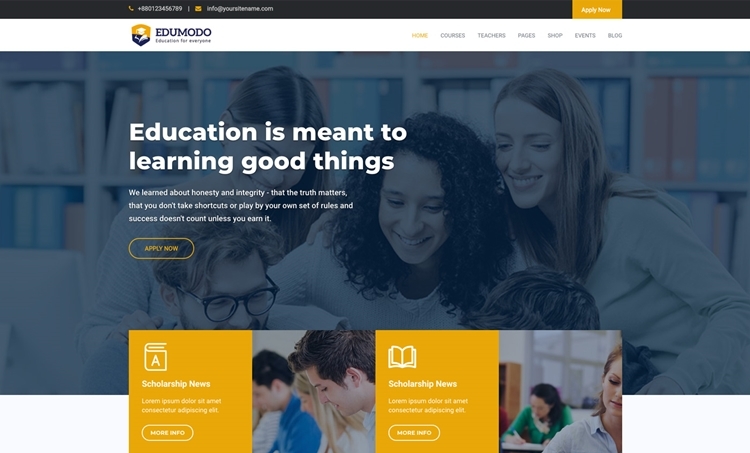 Edumodo education theme is one of the best themes in its kind. It comes with three most popular LMS - LearnPress, Sensei, and LearnDash support. You will be able to create a website for any education institution including university, college, school, kindergarten, preschool, daycare, etc. You can quickly build your site without any kind of hassle as this theme comes with Elementor page builder and fifteen ready-made responsive demos. Within a single mouse click your whole site will exactly look like the demo, then a little bit customization is just needed to complete your website. With Edumodo you can easily create, manage and sell courses easily, in addition, you can take quizzes and grade it too. If you value for your money, then Edumodo is the best choice for you. It allows you to create a website easily, manages everything autonomously, lets you sell courses & materials, and comes with many demos, pages and styles for every possible educational website. Only Edumodo provides you with these awesome facilities in one single theme. Academy is one of the WordPress Courses themes. It provides the feature to create and manage online courses. The theme also has options to sell the courses. With the theme, you can enable user registration. The users can manage their profiles on your website. The theme comes with post types for courses and lessons. With the theme, you can create Courses and make it available for subscription. With the theme, it is very easy to manage the users who subscribed for a course. On the course completion, you can award a course completion certificate. The Lessons can also be added to a course. For the lesson, you are allowed to attach files and a media player and image slider. Academy allows unlimited sidebars and short-codes. If you wish to integrate e-commerce facility into your website, you can use the WooCommerce plugin. Academy theme lets you chose from the pre-built page layouts, and create sidebars. WPLMS Learning management system is one of the best education WordPress themes. It is a online learning theme. If you want to create a comprehensive online education website, this theme is for you. You can choose from available demos and go for the one you like. With a single click, you can import the demo data and make your site look just like the demo. WPLMS has it all - You can create, manage and sell courses, arrange quiz, assignments, register instructors and students, award certificate, etc. There's also the option to create and display course events. WPLMS also allows to manage the course from the front end. The theme has a shortcode generator. Being compatible with the WooCommerce plugin, you can sell courses on your website. WPLMS Learning management system is also compatible with the paid membership pro plugin. So, there's more than one way of making money through the website. Start forums and discussions on your e-learning portal using the bbPress and BuddyPress plugins. Want to create a website for children's daycare or school? Peekaboo is for you! 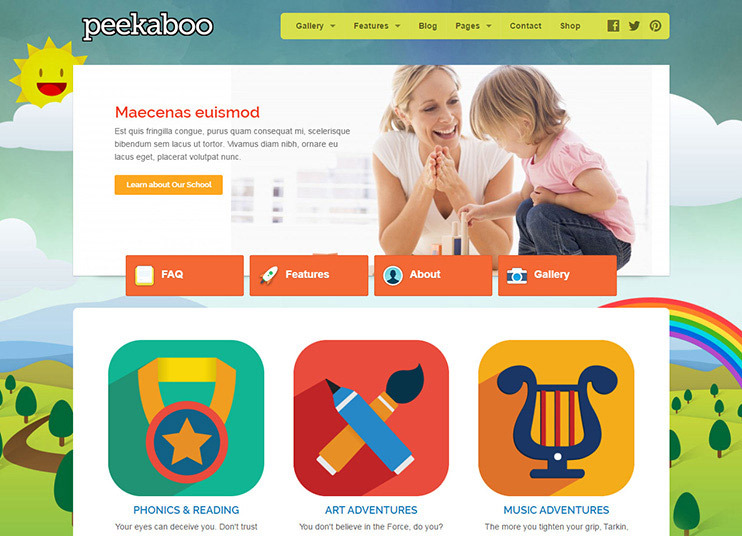 Peekaboo allows you to create a fully customized learning website for children. With a responsive layout, your site will be accessible to its user in any device. With FlexSlider and Orbit Slider, Peekaboo allows responsive image slider. The slider can also be content/post based. Besides, you can upload a custom logo, choose from Google Fonts, and lots of custom page templates. Peekaboo has a scroll to top button. So, you won't need to scroll back all way up to the beginning of the page. The theme supports responsive videos from Vimeo and YouTube. So, you can directly provide the videos to your audiences. Using Peekaboo you can create your learning site easily, in any language. The theme is translation ready. The background image of the theme can be changed with easy options. 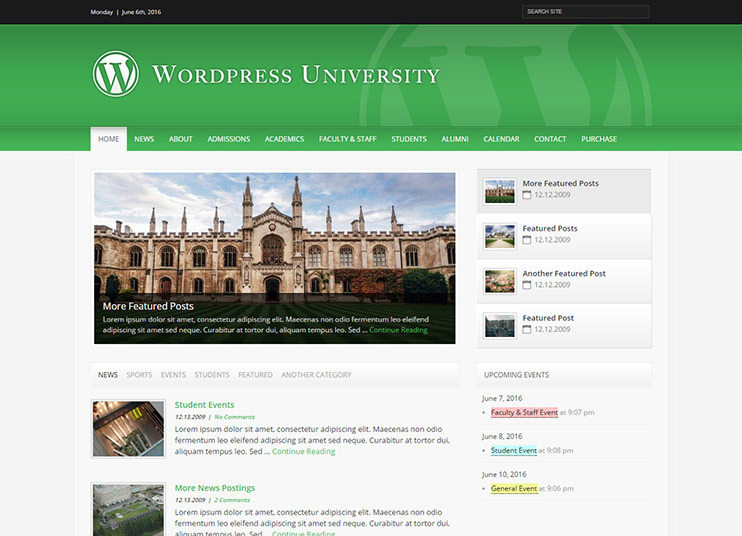 University theme is one of the most flexible WordPress university themes. The website created using the theme can have educational courses, training and events listed on it. With University, it is possible to sell events tickets and courses too. There are 7 versions of Demo available. Choose any of them and install it with just one click. The theme is compatible with the WooCommerce plugin. To create a Learning Management system with the theme, you can integrate the LearnDash plugin. To start Forums, integrate the bbPress. The theme supports Facebook and Disqus comments and it's already integrated into the theme. To earn more with the theme, you can use the google Adsense. 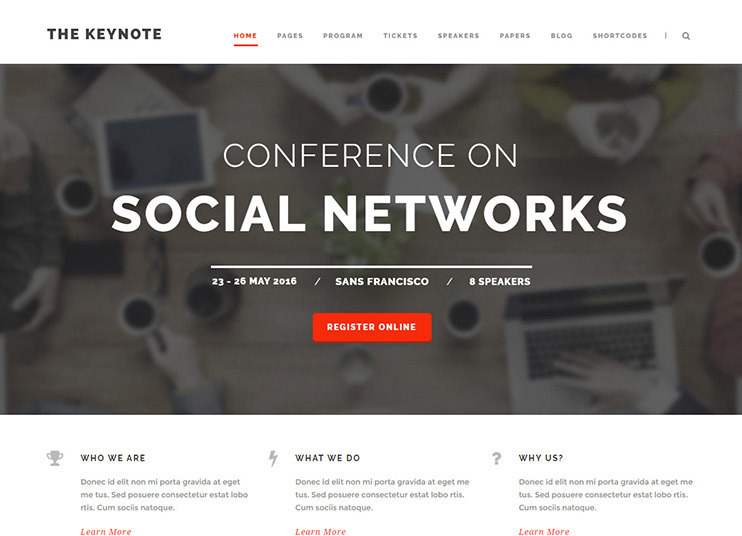 The Keynote theme is responsive theme designed for Meeting, events, events management and conferences. Keynote comes with paypal integrated. With the theme, you can create a website that can sell events tickets. The theme has facilities to create a time schedule or program and display it in an organized way. A beautiful page that displays the speakers/participants of the conference or meeting. Such meetings and conferences can be educational or subject related. So, with this theme, you can create an educational website that shares knowledge by conferences, meeting or events. Keynote comes with unlimited customization options. Select from the full-width or the boxed layout of the theme. You can easily install the demo data and make your site look like the demo. With advanced admin panel, you can change the color of the theme. Select from the available fonts or upload new ones. The theme customizer and the page builder will let you create your own designs with easy options. For this, you can also use shortcodes. Turn your meeting or events website into an e-commerce with the WooCommerce. Clever Course is a Learning Management system from Good Layers. This responsive and SEO optimized theme, has a minimal design. The theme is ideal for creating an online learning website. You can also use the theme to create a website for a school, college, university or any educational institute. Cleaver course allows the instructors to create courses and add content to it. The instructor can also create quiz and offer them to the students/subscriber. The interested students can subscribe to the courses by paying fee. To accept the fee, the cleaver course system has paypal inbuilt. On the completion of the course, the theme also allows to award a certificate for the course. The theme has also the facility to let the subscriber rate the course. This will help to show the visitors the overall quality of the course. With the Cleaver course theme, you can create a learning website in multiple languages. This will increase your website's usability and your courses can be availed by a larger group. 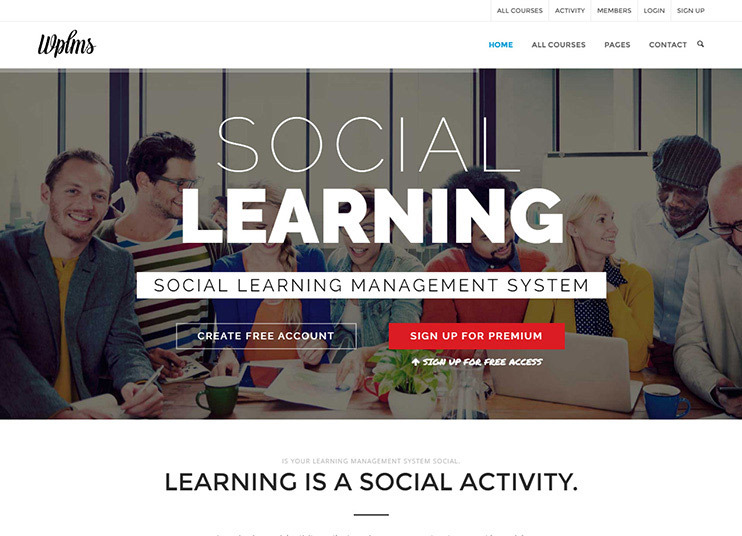 LMS is a wonderful WordPress Learning management theme. With unlimited customization options you can make a website of your choice using this theme. You can choose from the boxed or fullwidth layout of the theme. You can create free and paid courses. The theme also has the option for course analysis using graphics. The theme can be made socially active using the BuddyPress theme. With the visual page builder you can create page layouts. You can sell on your theme using the WooCommerce plugin. The theme is compatible with the Sensei plugin. It is also compatible with the Events Calendar pro plugin for displaying events on the website. Happy kids have a cute and colorful design and actually designed to make the kids happy on the very first sight. 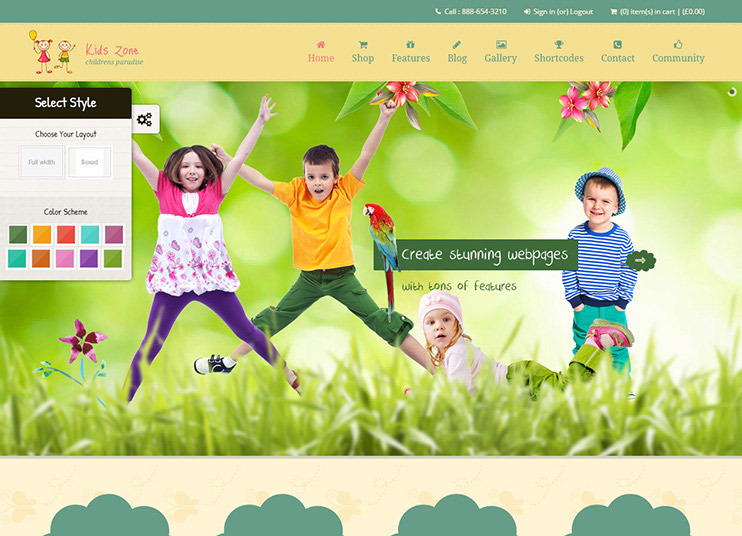 You can use Happy kids theme to create any kids related website. The theme is best suited for kindergarten, pre-schools, and daycares. Now no more boring website for kids. The theme comes with revolution slider included. You can change the slider as per your needs. Everything in the theme is flexible. You get to choose from 9 pre-made background sections. The admin panel of the theme allows you to change the colors of the theme. Happy kids also allows you some pre made page templates to choose from. Moreover with shortcodes and custom widgets you can do almost anything with the theme. Happy kids also allows to post tutorials and learning content in form of text, images or videos embeded from Youtube or Vimeo. Along with spreading knowledge among kids, if you want to sell anything on your website, you can do that too. With the WooCommerce plugin, you can include e-commerce facilities in the website. Using WooCommerce, you can sell shippable or downloadable products. 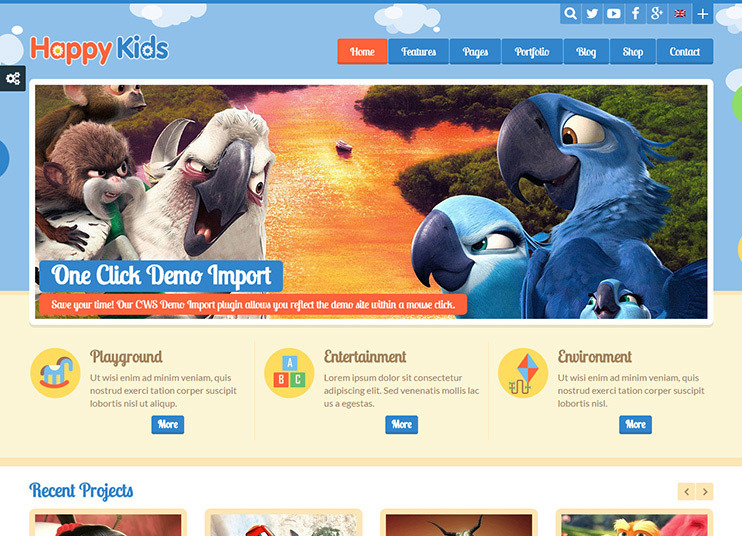 Baby kids is multi-purpose theme for creating kids educational website. The theme has a pleasant and colorful design. You can import the demo data to your website by just one click. To provide the ease to access the site, the theme has an advanced search option in it. To make the site look attractive, slider revolution plugin is already included. For the newsletter facilities, you can integrate MailChimp. The site is easy to create and manage using the visual composer. With the admin panel options, you can change the color, background, fonts and icons of the theme. The theme also lets you create and manage a time table. To create forms, you can use the Gravity forms and Contact Form 7. The powerful theme options will let you change the theme according to your needs. Be it a kindergarten, elementary school, or preschool, the theme is perfect. With the flexibility and a large number of plugin compatibility, you have unlimited opportunities. With WooCommerce the site can be converted into an e-commerce website. 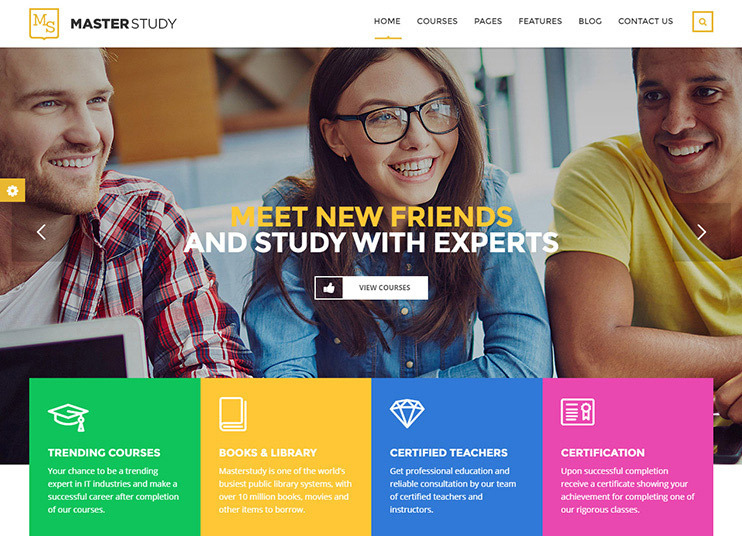 Masterstudy is all you need to create an education related websites. It has the facilities to create paid or free courses, education related events, and everything needed for a learning hub. Being, specifically designed for learning website, the theme lets you create courses. To accept payments for the paid courses, PayPal comes integrated into the theme. You can use the WooCommerce plugin to help the payments. The theme also has other features like the course rating facility for the students, pages for teacher's profile, etc. With the integrated Visual Composer, creating pages becomes much easier. For example, you can create pages with drag and drop options. MasterStudy also has a number of customization options. You can change the color, select from the two available header styles, skins, fonts, etc. Besides, you can also add blogs and events on your website. Kids Voice School is a responsive and interactive theme for child school, preschool, Kindergarten or any child art, craft or learning website. The theme has an attractive and responsive design with simple and manageable features. With the powerful admin panel of the theme, you can change the look and the feel f the theme. Very easily, you can insert the demo data into your website and start editing it. The theme allows you to choose from the 10 available color schemes. For further customization, it comes with the shortcodes. To display the image gallery into the theme, there is a custom post type gallery. With this creating and managing gallery becomes an easiest task. So if you want to explain something using images, that can be easily done. The theme comes with an Ajax contact form. 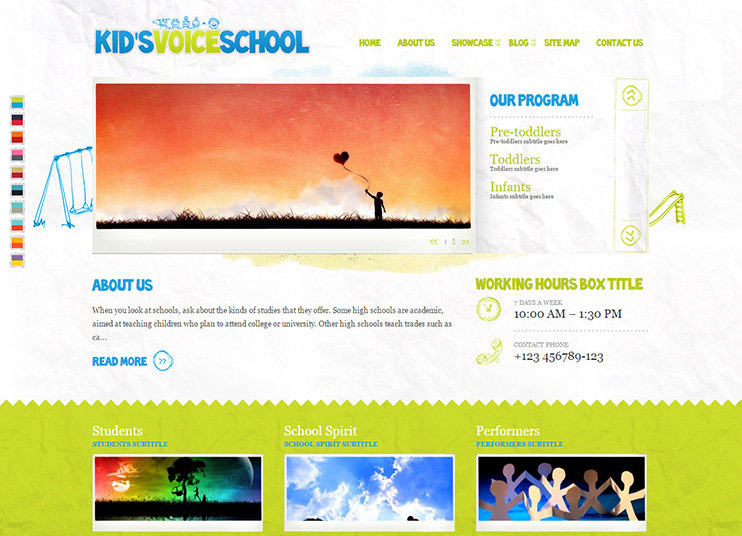 Kids' Voice school has a simple design and very basic features. But it is easy to use and has a lot of options to show your content and manage the look. It can be a best choice if you want to create a simple website that focuses on spreading knowledge and building a creative kids website. 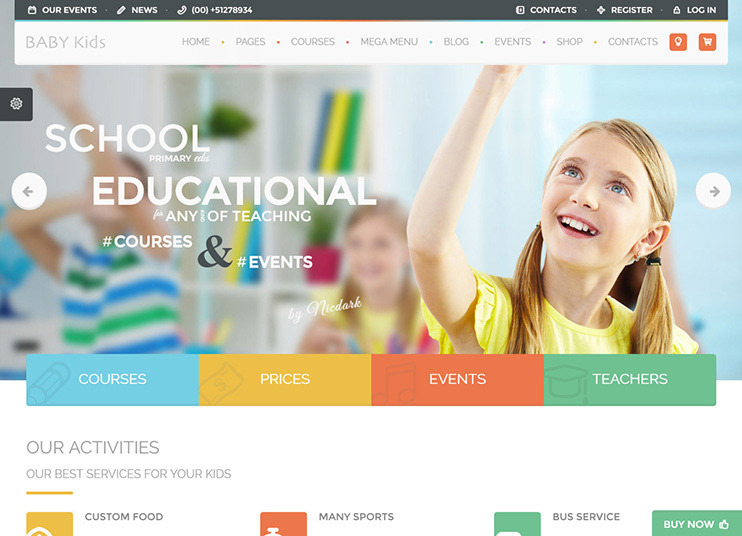 It is one of the best Education WordPress theme. Education WP comes with more than 10 pre-made demos. Education WP uses an in-built LMS system. This comes with an inbuilt LearPress add-on. So, if you ever wish to run your website without it, you can easily disable it. Generally, LMS is assumed to be difficult to manage, but not with the Education WP theme. With Education WP, there comes a drag and drop course builder. Once the course is ready you can sell it with PayPal, Stripe, Authorize.net and Offline payments. You can also use the paid membership pro add-on for this. With the bbPress, you can also start forums on your website. You can also create and conduct quiz on the site. Not just LMS, the theme also allows you to create events and sell events tickets on your website. 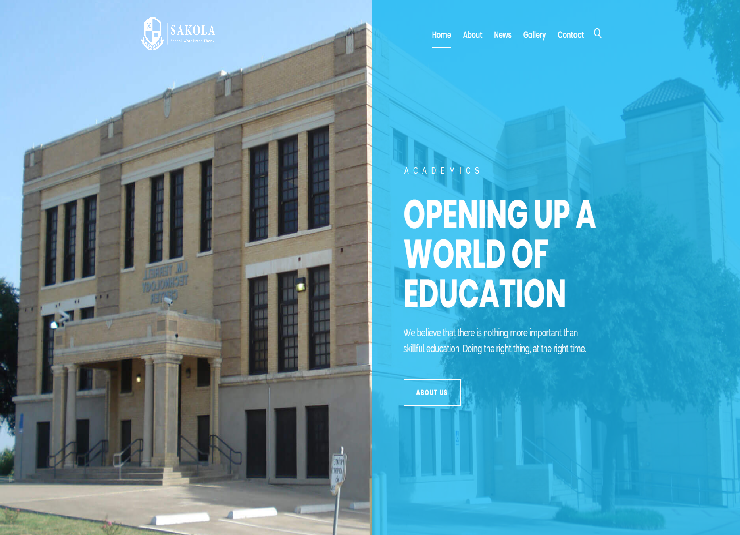 Sakola is one of the best education WordPress themes that is suitable for schools and colleges. This education WordPress theme as multiple header styles options and easy to use customization as per your needs. Install the theme with just one click. Sakola is an SEO optimized theme. Moreover, it is an elegantly responsive theme, so that your website looks great on any device it is viewed on. This WordPress theme comes with unlimited color options and more than 600+ Google fonts. 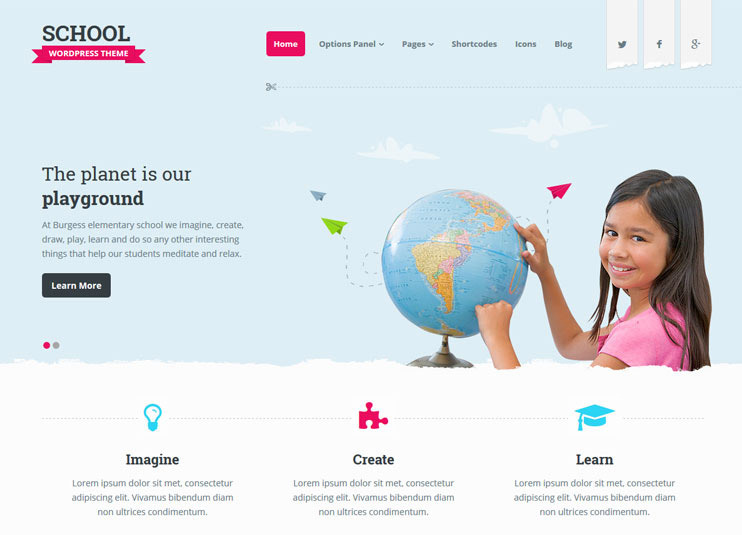 Fable, is a perfect name for the theme that lets you create kids' education websites. The theme is perfect for creating kindergarten, primary/elementary school, nursery, summer camp, babysitting or art and craft school's website. You can also use Fable as a theme for teachers. It comes with 5 premade homepage layouts(including a one-page layout too). Fable has a built in drag and drop page builder with more than 35 components. So, easily make a page of your own design. To give a beautifying look to the theme, slider revolution comes built in with Fable. The theme also has a built in timetable. The theme style panel lets you set styles for the theme. From here you can change the color of any element of website. The theme options panel will allow you to change the theme settings like fonts, favicon, logo, blog and post options, etc. Carry Hill School is a responsive and education based theme for WordPress. 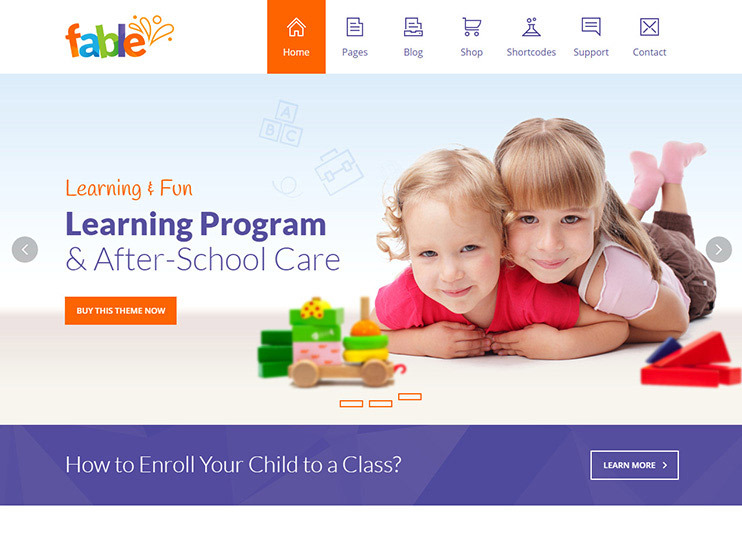 The theme is basically prepared to create a school or child care center's website. But you can also use it to create a website for kids learning or any arts or crafts or creative website. To provide you the ease of page building, Carry Hill School comes with Visual Composer. Now, you can create the pages of your imagination with drag and drop options. You can select from the 9 color presets. The theme option panel, is very powerful yet easy to use. Carry Hill school has the schedule plugin, Timetable schedule for creating and displaying timetables. To make your site look more attractive, it also lets you use number of icons. To create e-commerce facilities in the website, you can integrate the Ecwid. To let you make pages of your desire, you can use drag and drop page builder. Kids zone comes with the Visual page builder inbuilt. The theme comes with a mega menu support so that you can display all the options of your site. It has a sticky navigation option with 3 header options. For beautiful image gallery, the theme has gallery item masks. It also allows you to choose from the available skin patterns. The theme has options to change the colors and fonts of the theme to customize it according to your needs. It also has 6 homepage layouts to choose from. To make the content interesting, you can use the font awesome icons. Kidz zone is SEO optimized and translation ready. http://templatic.com/wp/recommend/Magicreche is a responsive and retina ready theme. 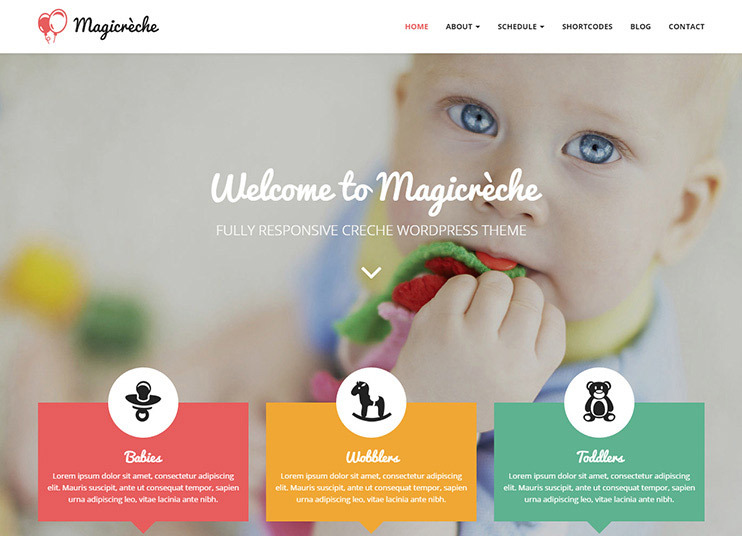 With this theme you can create a website for creche and pre-school website. There's a slider that introduces the staff to the visitors. The theme has multiple shortcodes, that you can use to create your website. With the advanced admin panel of the theme, you can change the color and fonts of the theme. Magicreche allows creating posts with simple text, images, video embeds, and audios. The theme options allow you to change the theme behavior. So, you can make the theme work just like the way you want. The ParkCollege is a theme for creating a website for learning and education institute. The theme design is responsive. ParkCollege comes with a course builder that allows you to create courses. You can also use the theme to create blog posts. The post allows video support. ParkCollege has powerful theme options. Using these options you can change the fonts, and colors of the theme. Without needing to know the code, the theme lets you change the color schemes of whole website. 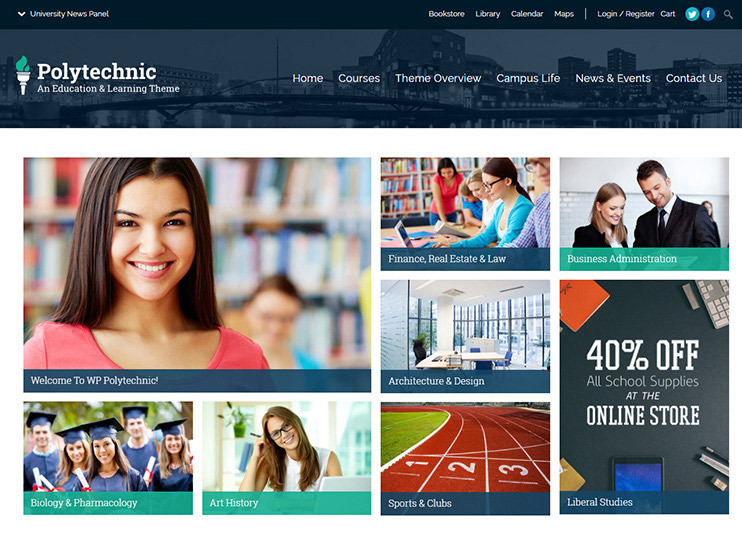 Polytechnic is a responsive and professional education based theme. 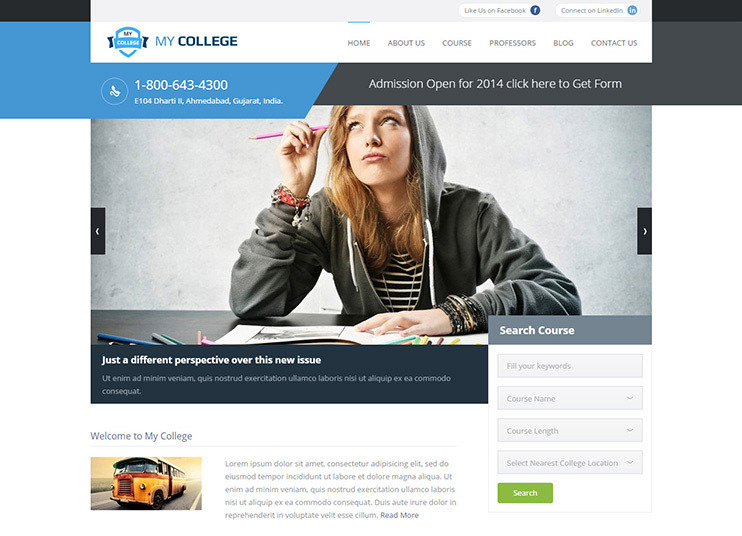 It is ideal for creating a website for colleges or educational institutes. The theme features a drag and drop page builder. And it is none other than the Visual Composer. So, building pages in the theme is just a matter of drag and drop. If you need to change the theme's colors and fonts, you can do it using the live customizer. The theme has a powerful control panel that allows you to manage and change the basic theme options. Polytechnic is WooCommerce ready. So, if you want to have any e-commerce facilities in your website, that is possible too. Polytechnic is translation ready and using the WPML plugin. You can also create a website in multiple languages. Guru is a theme for creating a Learning Management system. Based on the LMS plugin - Sensei, the theme lets you create a comprehensive WordPress learning website. Guru comes with a Visual page builder. With lots of available page elements, the theme allows you to create pages with drag and drop options. The theme has inbuilt clean and manageable login and registration facilities. It supports mega menu with image. Guru has a lot of blog and portfolio options. In addition, there are shortcodes, to add to the theme's utility. For learning management the theme supports the Sensei plugin. With this, you can create courses, add lessons and create quizzes. You can also create and manage tests. For the quiz grading, you can choose the automated grading or manual. You can also monitor the Course analytics with Guru. The theme is SEO optimized and RTL ready. It has all the options to change and manage the appearance of the website. 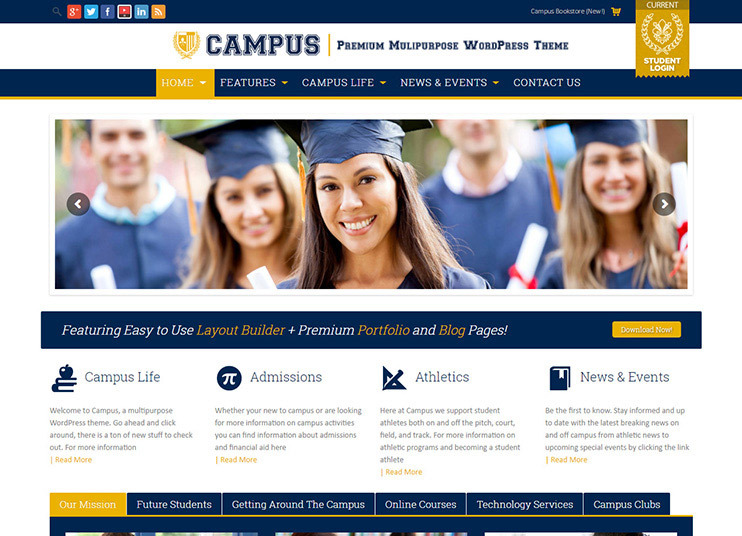 Campus is a flexible education based WordPress theme. It can be used to create an educational website with easy and super-flexible options. Campus has followed strict coding rules, so it offers compatibility to most of the popular WordPress plugins. The theme has easy options for customizations. You can set how you want the slider to behave. You can also change the fonts and color of your site. The theme also allows to create your header styles. Ultimately, you can make the theme look and work just like the way you want. Campus is also compatible with the WooCommerce plugin. So, you can easily integrate e-commerce facilities into the theme. Being translation ready, the theme allows you to create a website in your own language. Lighthouse is one of the Best Education WordPress themes for building a website of school or kindergarten for kids. This theme is Fully responsive and WooCommerce compatible for eCommerce features into your website. Everything in this theme can be managed with easy options from the backend. This education WordPress theme is compatible with Revolution Slider, Visual Composer, MailChimp, Booking Appointments plugin, etc. Invent is an online course theme. It comes with support for SiteOrigin page builder. The drag and drop page builder will allow you to create pages with utmost ease and flexibility. Along with the page builder, there are some more than 30 page builder widgets. You can choose from the boxed or fullwidth layout of the theme. You also have unlimited opportunities to change the page header of the theme. The theme option panel has more than 200 options in the theme. You can change the color of the website easily. You can also choose your fonts. 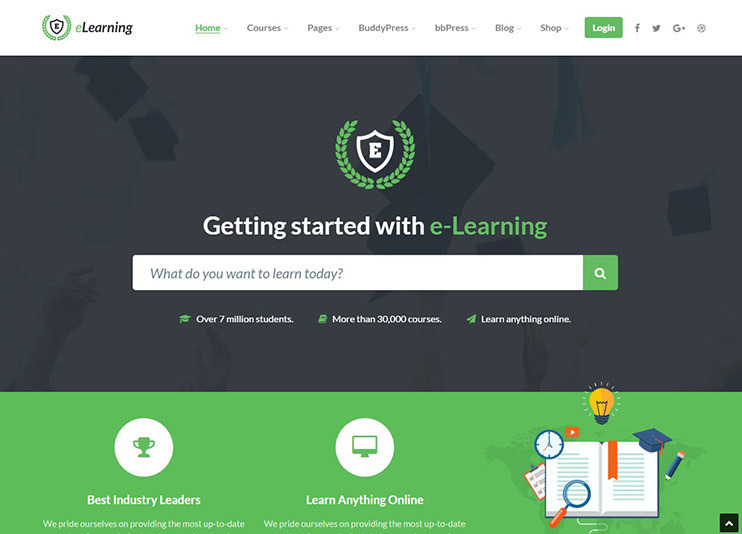 Invent uses the LearnDash plugin for the Learning management facilities in the theme. 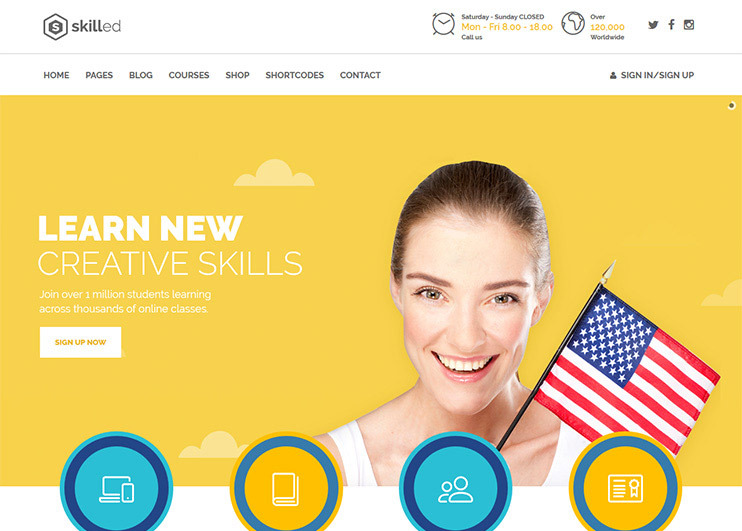 With LearnDash you can create and sell courses. Also create quizzes and grant certificates. The system also lets you have reports of the activities. There's much more you can do with this Learning Management system. 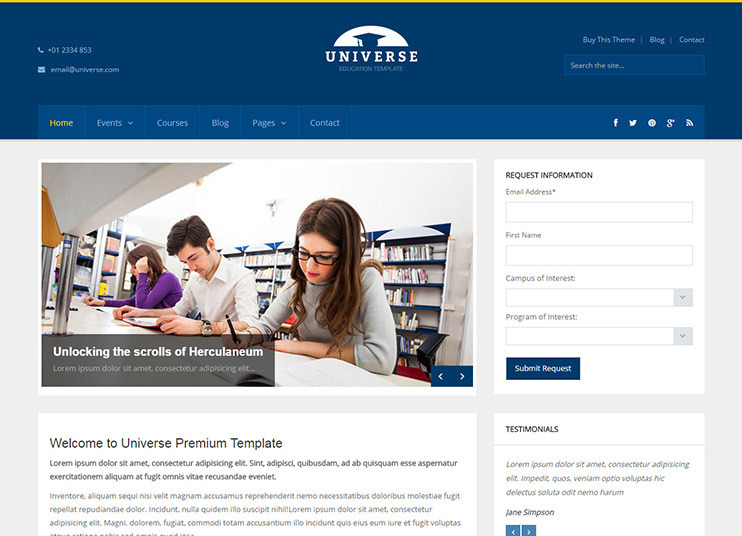 Universe is one of the WordPress education institute themes. The themes option panel is simple and easy to use. With these options, you can change the appearance and functioning of the theme. You can integrate MailChimp with the theme for newsletter facility. The homepage of the theme is totally widgetized, so you can change the page by managing the widgets. Universe also has the google maps integrated. It also has a working contact form included. To display the pictures and images clearly, the theme comes with sortable gallery. The gallery is easy to create and manage. 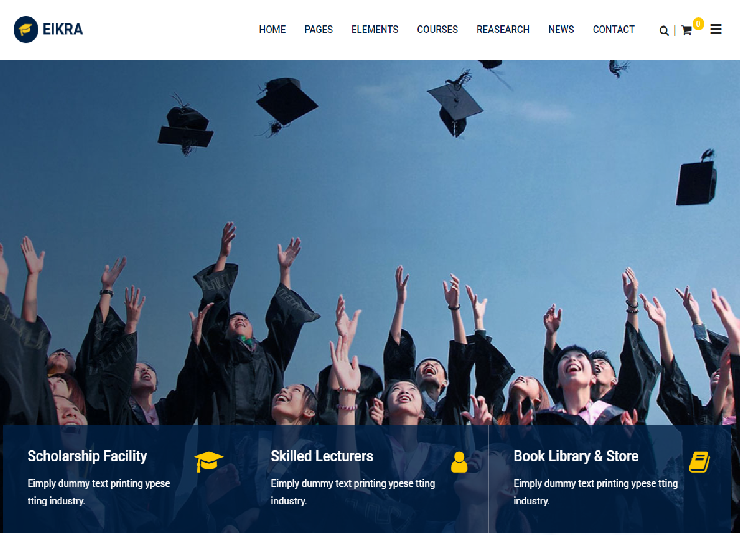 Buntington is an education WordPress theme to create website for colleges,university of schools. Buntington comes with an inbuilt visual page builder. This will let you create page of your desire very easily. This theme allows you to create reusable content chunks. You can create parts of pages or post and then insert it with a shortcode into the main pages. Buntington also allows you to create and manage courses. You can also add downloadable documents to it. Buntington also has the feature to add events. So, you can add and display the events with galleries in your website. To customize the theme, there are lots of shortcodes and theme options. With these options, you can make the theme work and look the way you want. It comes with the localization files, so you can translate the theme in your local language. 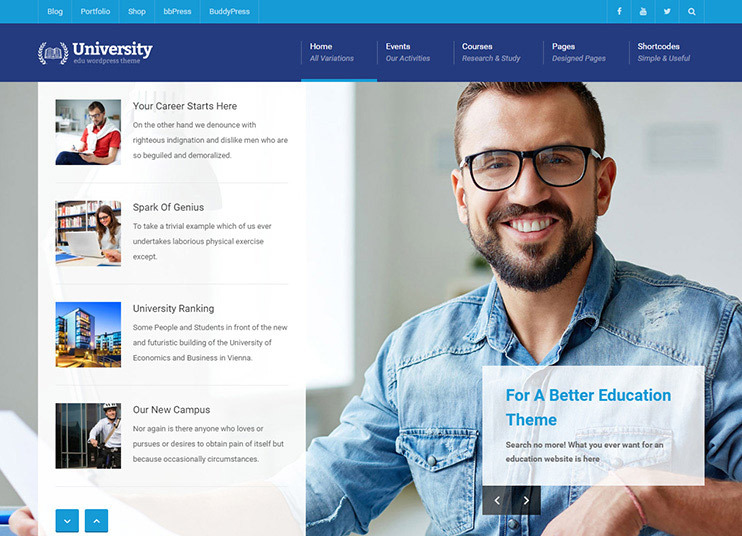 University is a simple but feature rich education based theme. With a clean look and easy options the theme lets you create a website for any educational institute. The University theme allows you to choose the colors for your website. To let you create a website in desired language, the theme comes with .po and .mo files. Using these files, you can create a website in your own language. 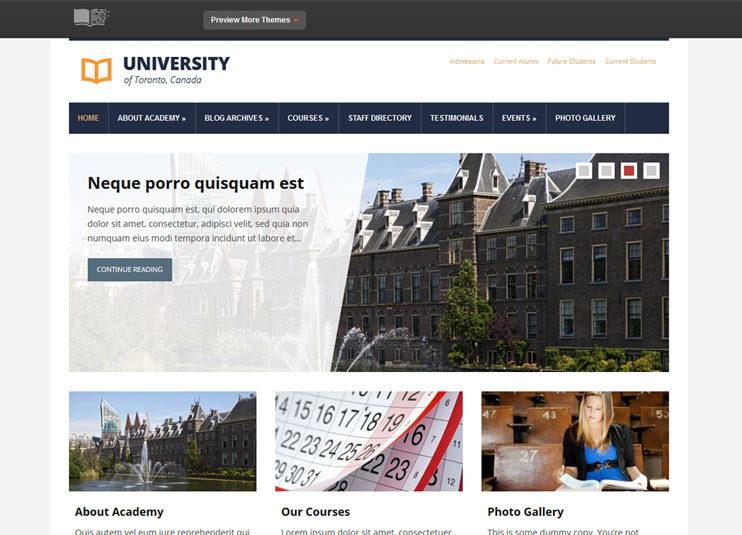 The University theme do not overwhelm you with number of features. But it surely has everything that you'll need to create a beautiful university/school website. 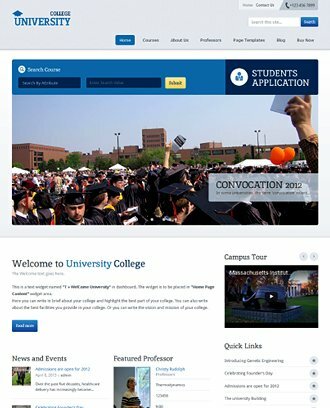 My College is a simple and flexible theme for creating websites for colleges, university, schools or any other educational institute. The theme has abundant features and they can be managed with easy options. It takes care that you can achieve what you want with any code tweaking. So, everything is provided in the form of easy options. You can choose from the 3 available color styles. My College is responsive. The theme is optimized for touch and swipe. The powerful theme options will let you change how the theme looks and works. To ensure that your website gets found, the theme is SEO optimized. To create a website in local language using the My College theme is possible too. You can use the .po and .mo files for translation. 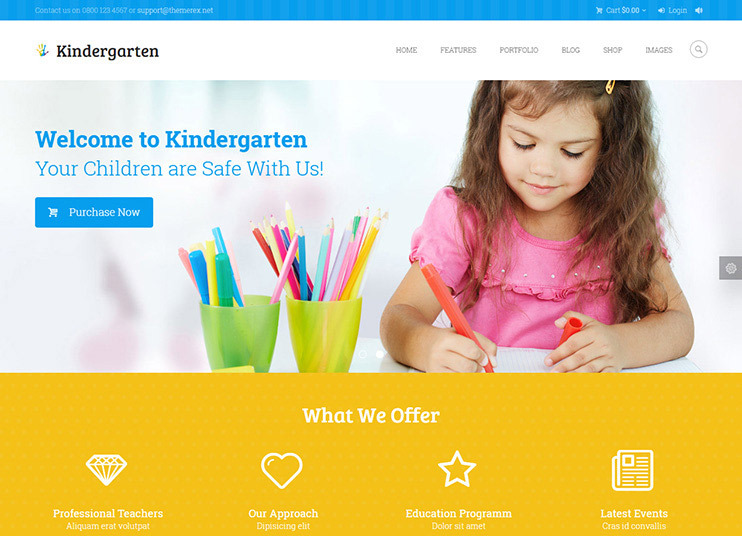 As the name suggests, the theme Kindergarten is designed for children's website. The theme will let you set up a children's website using easy options and flexible features. Kindergarten is performance optimized. The theme has multiple header layouts and blog styles to choose from. It also has a media content manager that will allow you to arrange the content. Visual composer comes inbuilt with the theme, so you can create pages with drag and drop. For facilitating the site visitors, the theme uses ajax search mechanism. 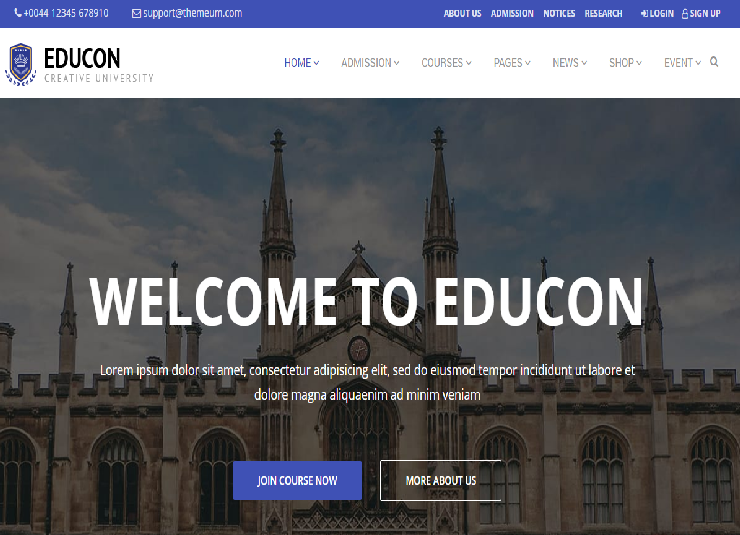 If you are looking for the Best Education WordPress theme then Edutech is definitely the one that you should take into consideration.This education theme is for educational institutes,colleges or similar institutions. The theme is really easy to customize feature and compatible with WPML. With the Visual Composer, you can now design your own pages with drag and drop options. Besides the pages and theme elements have some smooth transition effects. 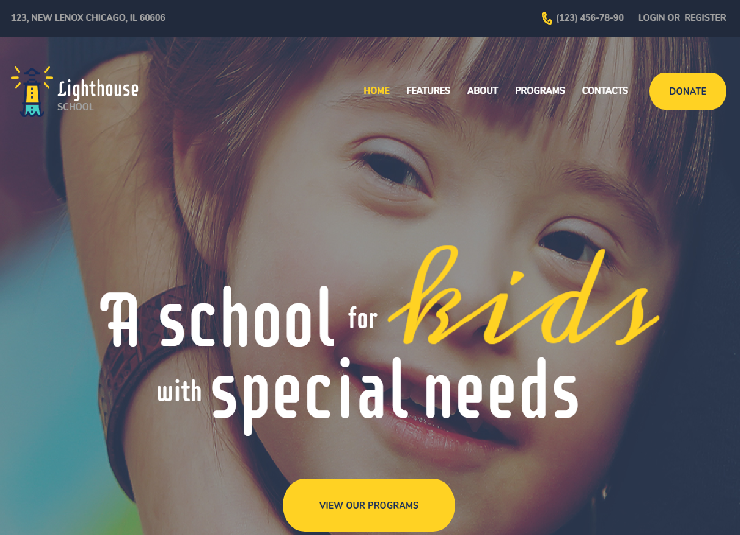 Little people is one of the best education WordPress themes for kindergarten, preschool or daycare. It supports beautiful video or image slider. You can choose from the boxed or fullwidth layout. It gives you a number of portfolio and blog layouts to choose from. With the Visual composer plugin, you can create and edit page layouts with drag and drop options. Little people Kindergarten theme has many customization possibilities. The theme has a powerful admin panel that allows to change the colors and fonts. It is essential for such a website to show the timetable. So the Little people integrates with Timetable plugin to display the schedule. Little people is translation ready. With WPML you can also create a website that supports multiple languages. The theme is compatible with the WooCommere plugin.. So, if you ever wish to include the e-commerce facilities into the theme, that can be possible too. 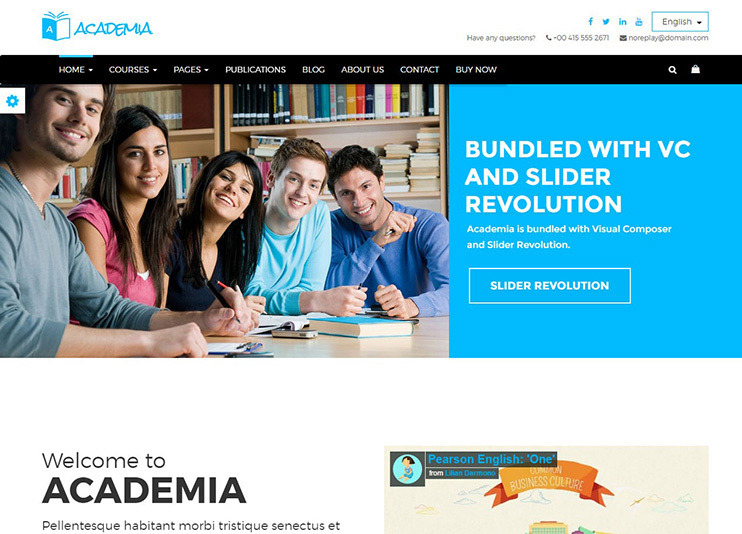 Academia is a simple, feature rich and easy to use education theme. The theme has all the features required for a full fledged education website. The Revolution slider makes the theme more beautiful. With very easy options the slider can be managed. You can choose from the there available homepage variation. Academia comes with ready to use pages. These pages can be used directly by replacing its content with yours. The theme has multiple header styles to choose from. Academia comes with Google Fonts integration to let you set the desired fonts. Academia is compatible with the drag and drop page composer, Visual Composer. The Visual composer will allow you to create pages very easily. Academia is SEO friendly. It also supports the most popular SEO plugins like All in one SEO pack and WordPress SEO by Yoast. For E-commerce facility in the theme you can use the WooCommerce plugin. The e-learning WP theme works on the base of the LearnPress. It is a free plugin for the Learning management facilities. 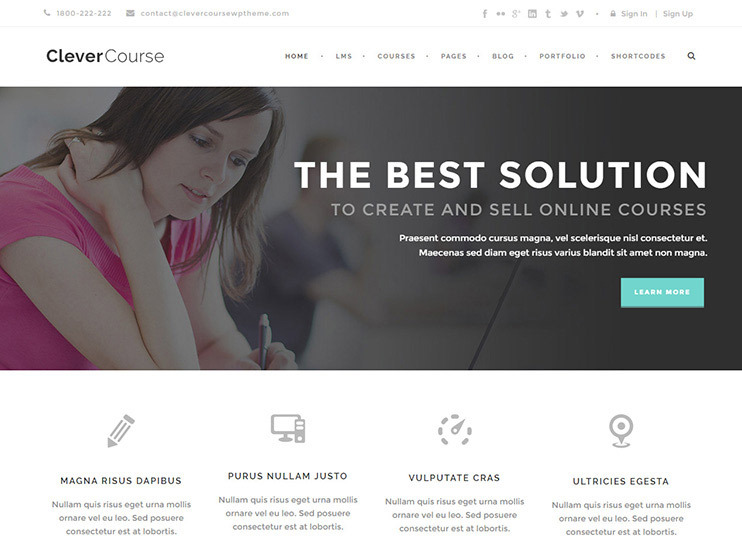 The theme allows you to sell courses with or without using WooCommerce. The theme comes with integrated stripe and Paypal and option for offline payment. E-learning WP is a flexible theme, and with the LMS plugin, the features of the theme are extended. All these features are easy to use. With the powerful admin panel of the theme, it becomes more easy to use. Everything that you'll possibly need to change, can be easily changed without having to change the code. On course completion, you can award a certificate to the student. e-learning WP lets you create the certificate design with drag and drop options. The theme is translation ready and SEO optimized. 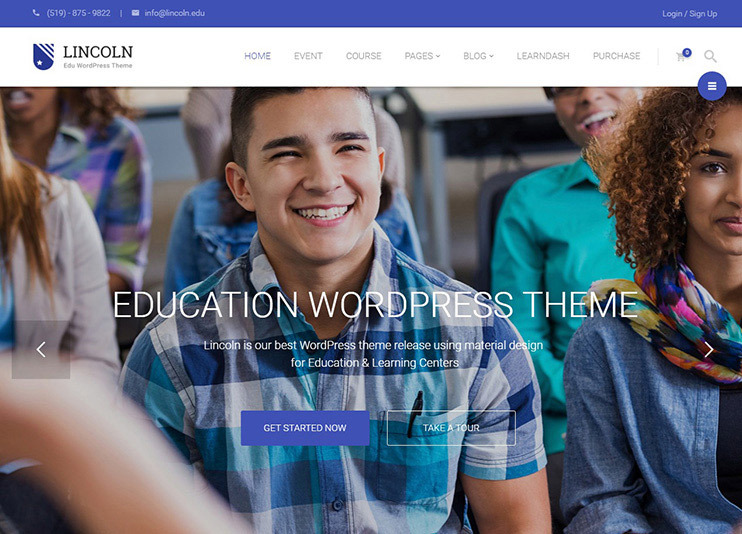 Lincoln is an Education WordPress website, that can be used for a simple educational institute's website or a Comprehensive learning Management system. The theme is compatible with LearnDash - a LMS plugin. With LearnDash, the website will turn into a Learning Management system. Add courses to the theme and sell them. Allow the visitors to check the courses and subscribe to theme by paying the fees. Also the theme allows you to add events and to sell the events tickets (using WooCommerce). Lincoln come with innumerable options for customizing your theme. All these options are intuitive and easy to use. The theme is performance optimized. It is SEO ready. Lincoln allows translation of website into desired language. It also allows multi-language translation of the website. Being compatible with WooCommerce, this theme ensures that you can also perform e-commerce transactions through it. 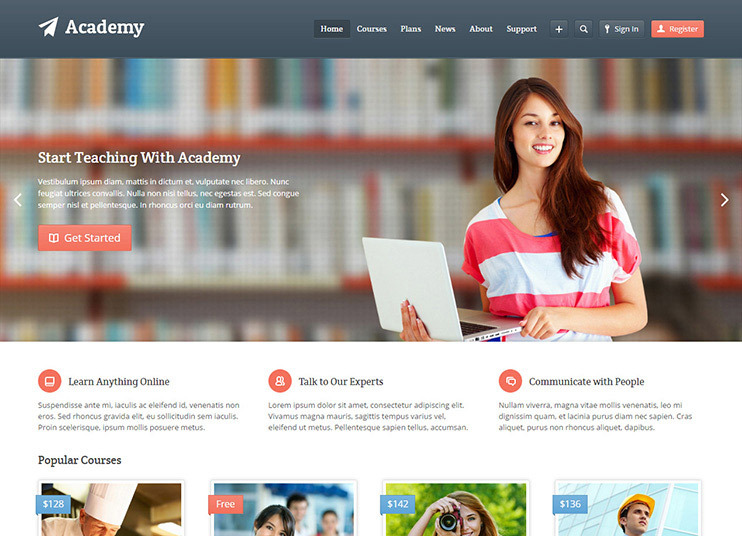 Academia is a very flexible Education WordPress theme. It can be used to create any kind of education based website. It comes with the beautiful revolution slider and Visual composer in-bundled. It also comes with sections that support parallax and video backgrounds. With Visual composer you will be able to design the page of your imagination with drag and drop options. With the theme, you can create and make course available for a fee or for free. The paid course can be sold using the WooCommerce plugin. The theme supports translation into single as well as multiple languages. It also is compatible with WPML for multi-language translations. Academia has number of theme options using which the website can be customized and made to work as you wish. Academia also comes with a child theme template included, for advanced customization. Skilled is one of the best training WordPress themes with an eye-pleasing design and fabulous features. The theme can be used to create a website that offers learning courses online. Being compatible with Visual Composer and ultimate add-ons for Visual Composer, Skilled provides the drag and drop page building facility. 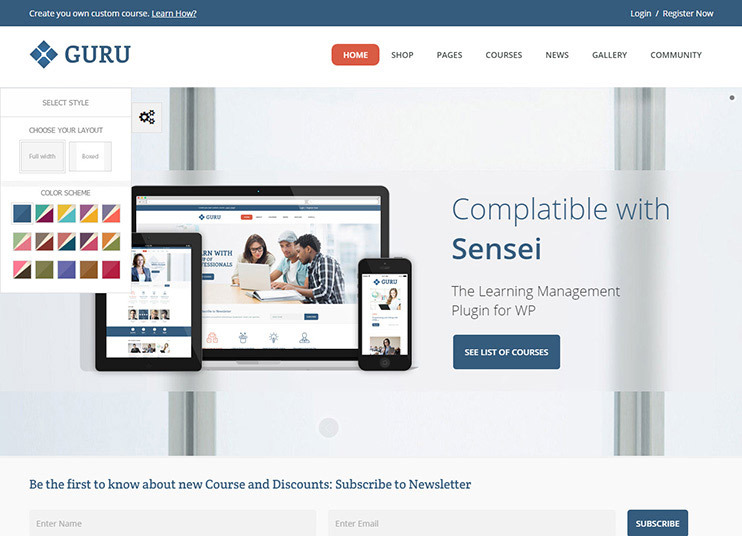 The theme makes use of the Sensei plugin for creating and managing course. The plugin can be used to create a course and sell it online. Skilled is also compatible with the WooCommerce. So you can sell tickets with it also. The theme is flexible. Even though it has a number of features, managing the theme does not become a difficult task. With the flexible and easy options, you can make whatever change you want in the theme. So with Skilled, you can create your online tutorial or training website very easily. Here is a theme that will let you create an online Education center with all the required features. With this WordPress education course theme everything can be managed using easy options. Education center makes use of the LearnDash Plugin to create and manage courses. The courses can be made available for subscription using the WPML plugin. There are many things you can do with the theme. You can use the blog and portfolio layouts for news and information purposes. The theme options panel has abundant options to change the theme behavior and make it work exactly the way you want. For customizing the theme, there are a lot of options. Education center is SEO ready and performance optimized. It can be used to create a translated website. The theme is also compatible with the WPML plugin for multi-language translation. University of College Education is a responsive and comprehensive theme with vast features and utility. Design of UOCE is elegant and responsive. It allows you to add courses, Events, Pricing options, Galleries, and teams. To build pages without ever needing to change the page design without ever touching the code, the theme comes with a page builder. There are number of possibilities to create and manage the events, adding them to calendar,etc . Besides, you can create and manage the courses. You can also display and manage the teams on your website. The theme comes with shortcode builder too. UOCE is translation ready and compatible with the WPML plugin. So, you can also create a website in multiple language using the theme. Erudito is from the WPZOOM theme that is basically a multipurpose theme. But it can act as one of the best education WordPress themes. You can choose from the 12 available skin colors. The theme comes with a homepage builder. The homepage builder will allow you to change the homepage layout as per your requirement. The advanced theme options will provide you options to make changes in the theme. There are plenty and easy to use customization options available with the theme. Erudito comes with SEO friendly code. It can also be translated into required language. Erudito comes with language files that makes theme translation very easily. School is a theme that is designed specifically for daycares, schools, coaching class and other educational institutes. The design of the theme is responsive and focuses on providing you maximum space for uploading your information. School has a design that suits its purpose. It comes with the post types for Gallery and Events. So, you can create a website that does not only allows to create and manage courses, but also allows the events and galleries. It also has other features like open hours and testimonials section. For usability, School has custom widgets that can be used at various widgets areas. These widgets are subject oriented and help making your online education website more interesting and convenient. School can be translated into desired language. It is compatible with the WPML plugin for multi-language translation of the site. The code of the theme is SEO friendly. School is designed to perform well in every situations. 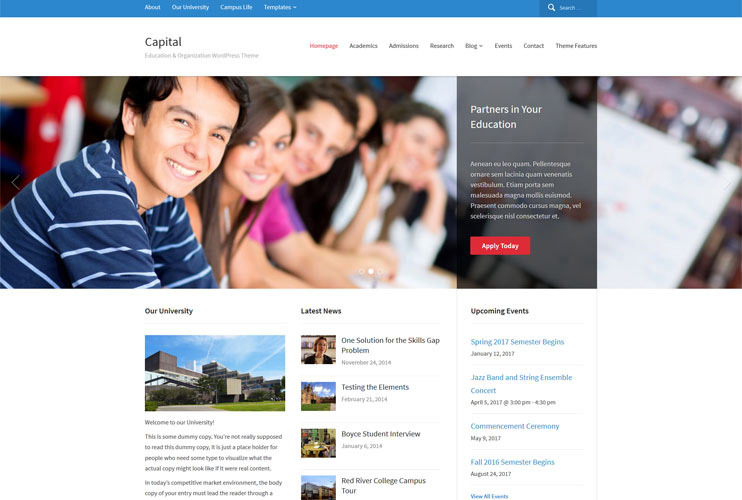 Capital is a best education WordPress theme for schools, colleges and educational institutes. It has a simple and professional design that allows you to create an online learning website very easily. The theme has a live customizer. You can preview the changes made to the logo, background and colors of the site, realtime. The theme's options panel will give you all the options to make the necessary changes in the theme. Capital comes with a support to show events in your website. You can integrate the Events calendar plugin into the website and show the events. The home page builder will allow you to create the homepage of your imagination. You can set the menu according to your needs. Capital also supports mega menus. Capital is SEO friendly and supports translation in desired language using the language files. Blackboard is a beautiful and amazing professional education WordPress themes from Academia themes. Academia themes has a club membership facility where you can pay $99 for the membership and access 5 themes(including Blackboard). Blackboard has a modern design and clean looks. It comes with custom page templates that you can directly use in your site. For further options, the theme has custom widgets that you can use for various purpose in your website. 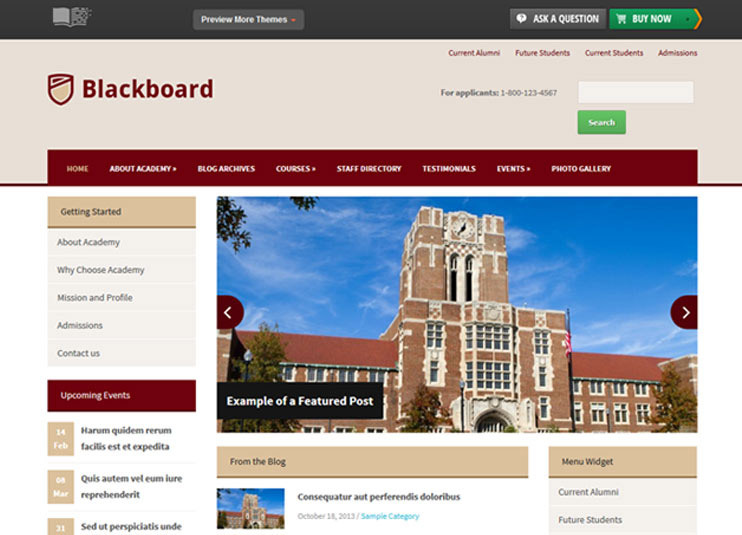 Blackboard is a Search engine Optimized theme. It can be translated into any language as it is localized. The theme is compatible with WPML plugin for multilanguage support. This theme can also let you create a website into multiple languages. 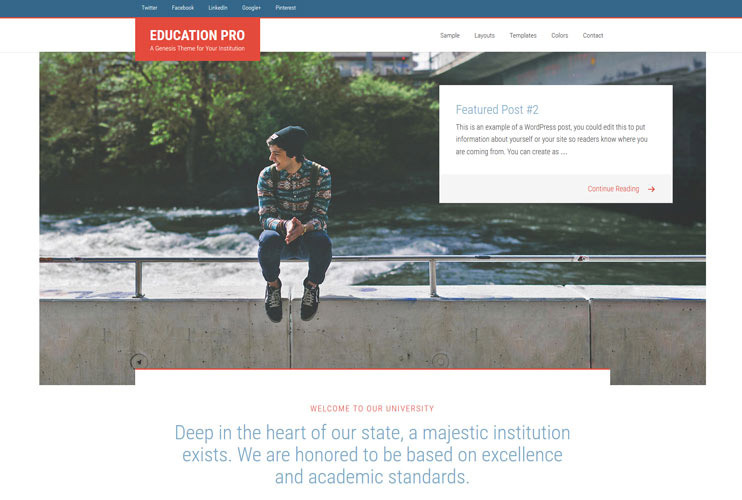 Education Pro from studio press is one of the best professional education WordPress themes. The theme has a simple design that focuses on the content. Education Pro comes with a lots of customization options. Use the Live customizer that allows you to change the theme's look within minutes. The customizer will show a live preview of the changes you make so you can try different combinations and go for the perfect one. Moreover, there are lots of custom page templates. To display your content, the theme supports text, images, videos, etc. The header of the theme can be easily changed too. The theme also allows to select from the available page layouts. 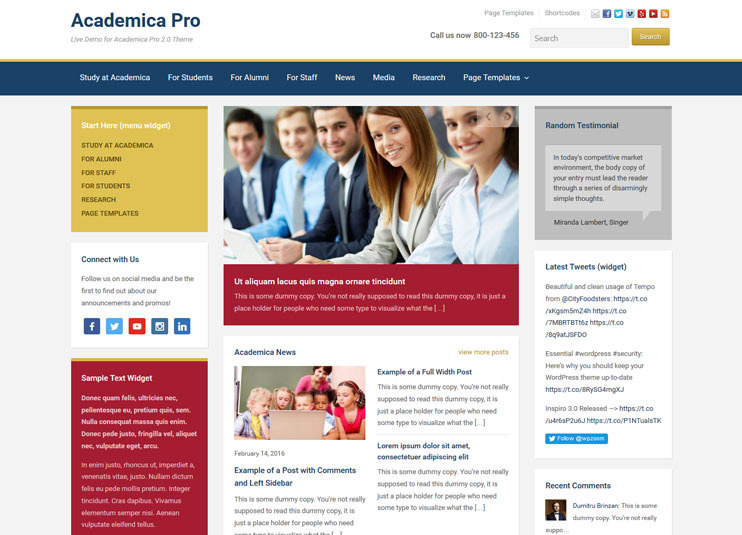 Academia Pro is a WordPress education institute theme. The theme lets you create website for schools, college, University or any educational institute. With the theme options you can change the theme settings very easily. Academia Pro is from WPZoom and it offers you innumerable customization opportunities. Use the built-in logo editor and create a logo for your site. Set custom background and change the theme colors. You can also set the desired fonts in your website. The slider of the theme can be configured to show the featured posts. Academia Pro is SEO friendly. It can be translated into any language using the localization files available with the theme. Lectura is a two column WordPress theme with lots of customization opportunities. The theme is from Academia themes. You can also use it as a private tutor theme. Lectura comes with a comprehensive admin panel that makes it possible for you to change the theme settings. You can use the available page templates and custom widgets in your website. The theme has options to easily change the color and backgrounds. Lecura supports video posts too. So, if you want to upload a video tutorial on your educational website, that can be done very easily. You can also post videos of the events of your organization using this feature. This will help you make your site more interesting and engaging. This theme is responsive and mobile friendly. Lectura is SEO optimized. You can buy this theme along with four other(All are education based themes) by becoming a club member. 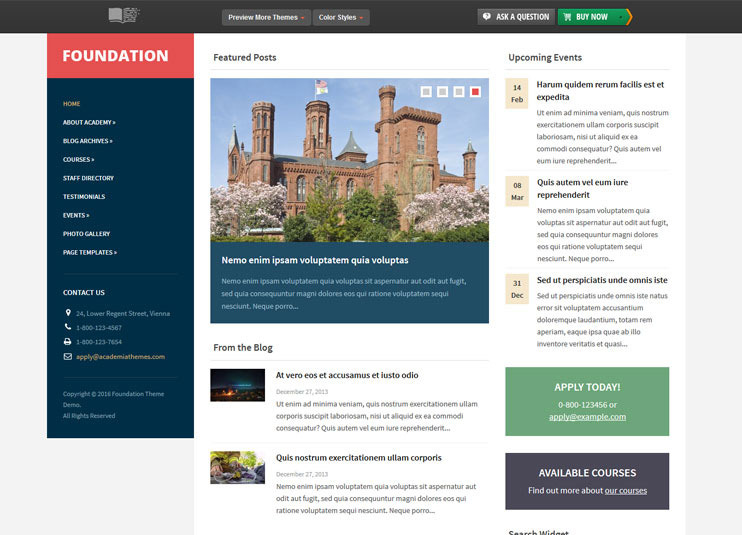 Foundation is a modern theme for creating educational websites. It is a responsive theme that lets you create a website for educational foundations. Foundation can be translated into desired language. The theme has compatibility with the WPML plugin, for multilingual translations. The theme also has Custom page templates to choose from. So, you just have to replace the sample data of Custom pages. Foundation also has custom widgets that can be used at different widget areas. Foundation is SEO friendly. Foundation is from Academia themes and you can buy it by joining the theme club. You can use the Educon Education WP theme for school, college, training centers, universities, coaching centers, etc. It comes with an advanced customizer option for you to create a professional good looking site for your organization in just minutes, without writing a line of code. Educon comes with different homepage variations. It is compatible with WPML and RTL Besides, the theme has megamenu options for a swift navigation and it is compatible with WooCommerce for eCommerce facilities on your website. 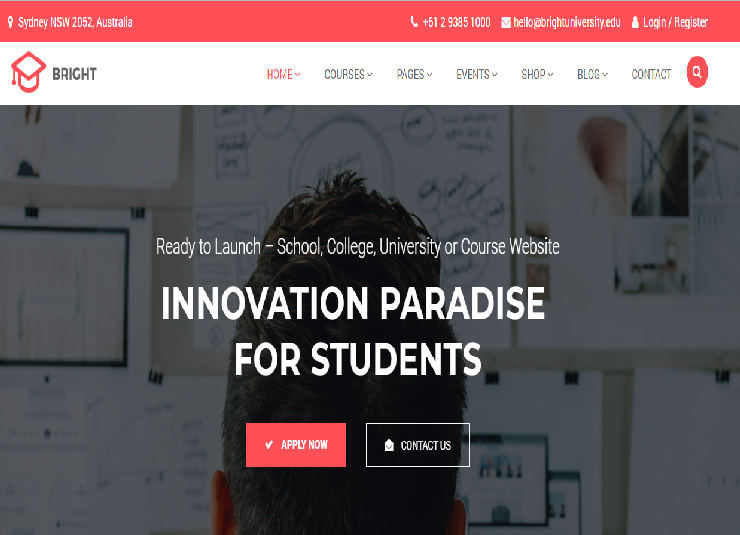 Bright is a Multi-purpose Education WordPress Theme that you can use to Create Complete Education Website for University, College, and Schools. It offers some of the powerful theme options and tons of ready to use built-in pages you can create a beautiful custom site for your institute. With compatibility with WooCommerce you can create an online store for your site.Other Key features included are the compatibility of WPML and Visual Composer. Besides you can create events through event calendar on your education WordPress website. 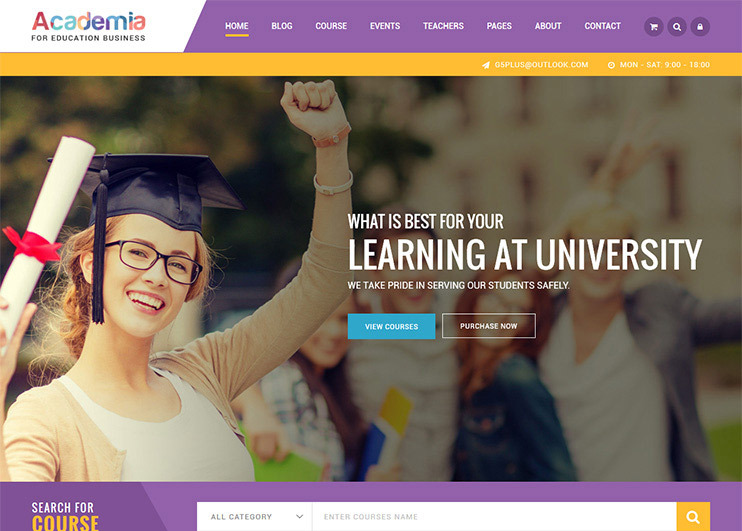 Highly Customizable Education WordPress Theme For University, School, eLearning and Online Tutorial. You can choose from 6+ Homepage variations and 30+ pre-built beautiful page layouts. Besides, you can easily customize your site easily with the options available at the backend. The theme supports some of the awesome plugins support such as Visual composer, WPML and WooCommerce. The Eikra education theme is responsive, mobile friendly and includes 600+Google fonts that you can use for your site. Choose your Education WordPress theme now..
All the Education themes in this list are premium themes, designed professionally to make sure that you can have a perfect education based websites, effortlessly. While some of these themes have the LMS capability, some are simple school, college or WordPress themes for an educational institute. You can pick a theme as per your requirement. If you have already used any of the above-listed themes, don't forget to share your opinion. Read: 7 best page builders to create your site effortlessly. Great list of Education Themes. Thanks for sharing! Any template which allows compatibility with Learndash and Sensei. I’m looking to work with individual development outside the school with the help of tutorial and other self Improvements. If you need compatibility of learndash I would recommend Invent as it properly supports Learndash. WPLMS also support Learndash but Invent has better integration. In regards to Sensei it is supported by LMS and Guru themes. Beautiful collection of the education templates for WordPress. Is there any theme that allows registered users to check their result Also, it permits the staff to add individual student report, as a result, all this can be collected into one data for students. All of the above LMS themes do have this functionality. This themes comes with full quick management and offers full courses. Nice Post along with Great and impressive Education themes. As per my opinion, I would recommend creating a simple regular blog integrate it with PayPal button embedded in posts. Whenever any payment is made you’ll be notified via email. In such a way you can manage. Again it all depends on your requirement and how you want your website to function. In regards to theme Guru is well suited for online courses. Which theme will be the best offering courses both for free and paid also providing subscription options, Compatibility with BuddyPress and I want to create a forum for my community as well. You can choose WPLMS WordPress theme which features Single Purchases, Paid subscription, online and offline course options and much more. The theme is compatible with BuddyPress and bbPress. With the help of which, you can create a forum for your community. WPLMS WordPress theme is an advanced theme and best fit for your need. Great list of Education Themes. with fresh and unique themes and a good description of the themes. Thanks for sharing. This is really an informative post. It saved my time. I appreciate your hard work. Karry on.